If you were to just sit and listen to the original music and lyrics composed by Ben Kauffman and Kyle Vegter that accompanies The End Of TV, that alone would be a pleasurable experience. But having that music along with the story that grew from it makes for an incredible evening of theatre. 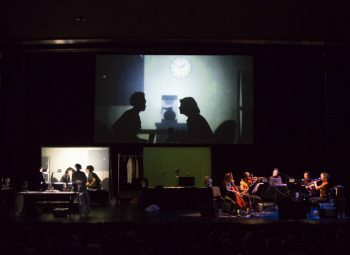 Now being presented by ArtsEmerson at the Paramount Center in Boston and created by Manual Cinema, The End Of TV is certainly one of the most original works you will see this season. Combining that sublime score with visual effects that include shadow puppets, overhead projectors, actors performing in silhouette, and a touching and moving story, it leaves you with 75 minutes of theatre that is deeply moving. The story, set during the 1990s in the Rust Belt, focuses on Flo (Kara Davidson), a retired factory worker who spends her days watching home shopping channels on her TV, and Louise (Sharaina L. Turnage), a recently laid off factory worker who has taken a job working for Meals On Wheels. Flo is slipping into dementia and her world is her television set. Louise is working to reinvent her life. Louise meets Flo while delivering meals to her, and at first their contact is brief, limited to the time it takes Louise to drop off Flo’s dinners. 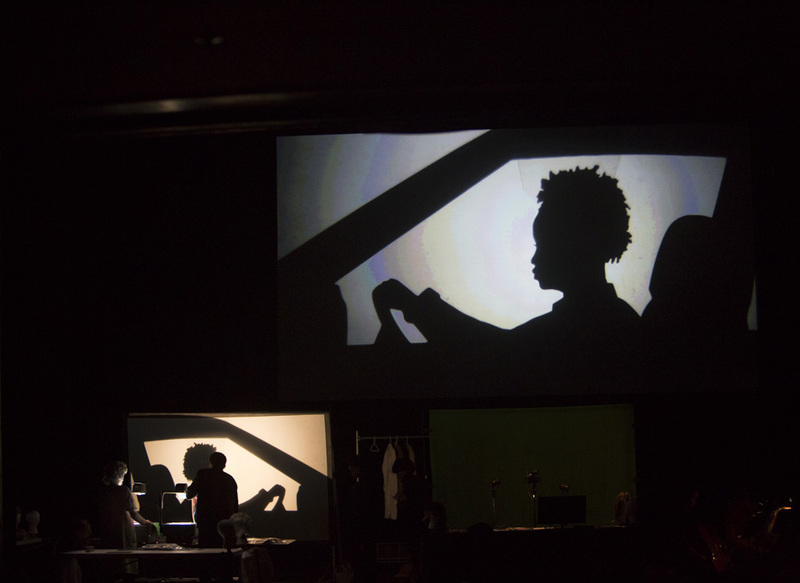 The two actors have no lines and are seen in silhouette projections on a screen hanging above the stage. The audience can see what is going on behind the scenes as the actors work in front of backdrop where their actions are captured and projected onto the overhead screen. The story is told with these images along with shadow puppets and scenes from television. It is remarkable to see the large array of emotions and expressions that are conveyed by the actors’ body movements. The lack of dialog and facial expressions actually enhances the emotional effect. A simple wave of the hand as a greeting gives the sense of connection that is building between the two women. It is fascinating to watch. The only dialog is from the actors portraying the people from the home shopping channel and 1990’s TV programs who are also projected onto the screen. There are even appearances by the Jolly Green Giant. 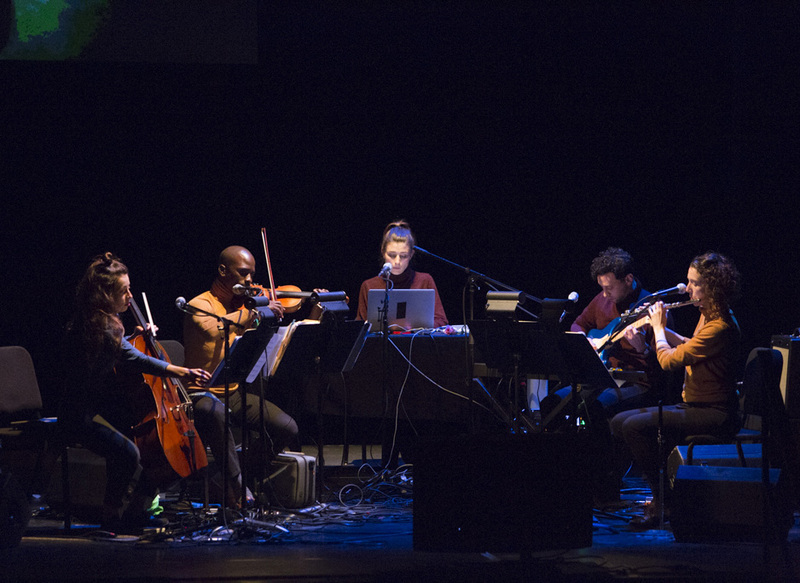 The five piece orchestra is on stage throughout the performance. The sound from a television can be heard throughout giving us the feeling of what it is like to be living in Flo’s world. We also learn about Flo and Louise through flashbacks. Flo had worked in the factory during WW II. It appears it is the same factory Louise was laid off from. Both have had ordeals to overcome, and I was struck by the quiet strength of each. The bond that grows between the two during the brief visits by Louise shows how important even a simple gesture of kindness can be. The fact that this is being done through silhouettes and without words makes it all the more touching. Discussing the subject of aging and the onset of dementia can make people very uncomfortable in today’s society. Not so in The End Of TV. There is a raw honesty to this work that allows us to watch and understand what happens in life as the aging process sets in. Seeing how much simple acts of kindness can mean to a person shows the importance of being connected to one another. And this is not just about what Louise does for Flo, but it also how Louise finds strength and hope in communicating with Flo. While dealing with sad topics, this is not a sad play; It is heart touching and hopeful. The use of shadow puppets interspersed with the actors give it a childlike innocence that helps to simplify the complexities of the story. The warmth that comes from witnessing Flo and Louise connecting serves to remind us of our capacity for kindness and understanding, something that we tend to lose touch with in this fast paced world. There is so much to be given to and learned from one another. In my mind I still have the image of Flo and Louise gently waving to one another, so simple yet so very moving. After the performance, the audience is invited onto the stage to speak with the actors and to see how it was all done. Creative, unique, fascinating, humorous and touching, this is a work that will capture your heart. The End Of TV is one of the high points in a very rich Boston theatre season. It is a beautiful work and I highly recommend it.